Kenya’s most prestigious marathon is now open for registration, giving you yet another chance to huff and puff in the wild for a good cause. And, who knows, you might also get the opportunity to rub shoulders with celebrity! Hundreds of marathon and wildlife enthusiasts are once again gearing up for one of Kenya’s most prestigious annual sporting events, when over 1,000 runners take on a grueling terrain on the foot of Mt Kenya for the Tusk Trust’s charity flagship event, Safaricom Lewa Marathon and Half Marathon, scheduled for June 24 at the Lewa Wildlife Conservancy. Britain’s Prince William could be among the 1,400 men and women huffing and puffing here as reports in British media – which have not been officially confirmed – indicate that he has expressed a wish to join the fray. Should he show up, however, this would not be his first time at Lewa as it was in the open savannah of the conservancy that he proposed to his then fiancée, Kate Middleton, back in 2010. There are a lot of parallels between the marathon and saving endangered animals. It’s a race against time. There’s no quick fix – it takes time and determination. At times it’s an uphill struggle, (but) progress is easier when a lot of people are aiming for the same thing. British celebrity Michaela Strachan, who once ran the Lewa course, in a BBC interview. The Lewa run, there is no doubt, is a grueling race, as the National Geographic Traveller writer Chris Peacock realised when he “fearlessly — or foolishly — signed up to run 42 kilometres across the scorched, undulating hills”. So, why does Safaricom get involved in this, to use Peacock’s words, “hard graft”? Over 35 nationalities are expected to show up for the run, back-dropped by the most spectacular wildlife vistas to grace any marathon course. The course cuts through one of Kenya’s most beautiful scenic offers as Mt Kenya stands in majesty to the south and the breathtaking views of Samburu and Mt Ololokwe crown the panorama to the north. The heavily protected 65,000-acre wildlife sanctuary is home to a rich mix of animals that every now and then joins the runners for the sprint. 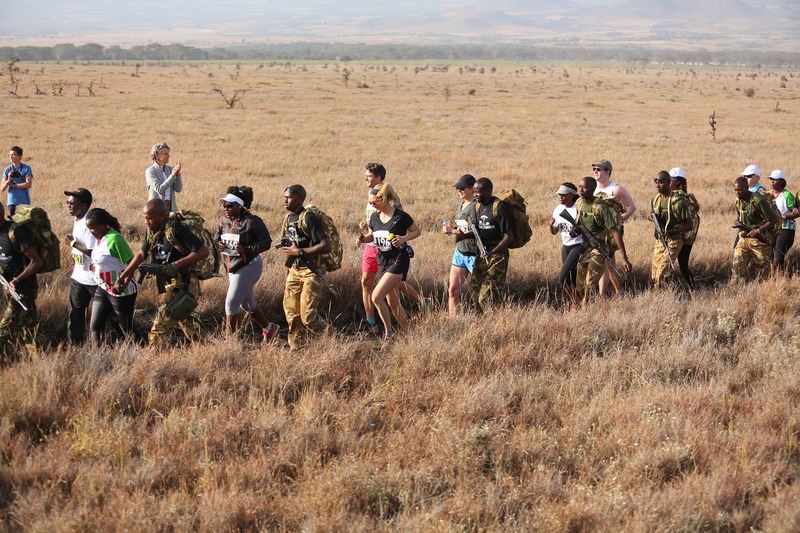 The safety of the marathoners is taken care of by 100 rangers spread across the course, and three helicopter crews. As any marathoner will tell you, the race itself can be one of the most physically and mentally trying things you’ll ever do, but the hard graft comes in the days, weeks and months of training. With a handful of marathons under my belt, I knew the myriad demands of training, but the prospect of attempting one at altitude, and in high temperatures, was a whole other beast. Chris Peacock, ‘National Geographic Traveller’ writer. The annual race, started in 2000 when only 180 participants showed up, has gained a life of its own and transformed the community around the park in the process. Tusk and Lewa have always shared the common goal of using wildlife conservation as a catalyst to alleviate poverty, reduce conflict, and improve education and livelihoods in rural areas rich in biodiversity, and this initiative has been doing just that for the last 17 years. Although the main purpose in Lewa was to support wildlife conservation — the conservancy being home to the endangered black and white rhinos, the largest grevy’s zebra population in the world and occasional Sitatungas, and over 140 armed rangers permanently based at the conservancy — more has been done for the community around it. For instance, every year funds from the marathon are allocated to Nanyuki Cottage Hospital for care of animal injury victims. And in 2007, more than Sh3.1 million was used to buy medical supplies and equipment such as digital blood pressure machines, stretchers, and beds for local hospitals. The same year more than Sh6.2 million was used to construct and furnish two new classrooms, a library, and a gate for a community school. A water project funded with proceeds from the marathon supplies piped water to the community and has become a lifeline for locals and their herds as the area is prone to long dry spells. The project has also reduced human-wildlife conflict, which was rife at watering points. When the Potentash crew visited the conservancy to interview CEO Mike Watson, they reported that it was “amazing to see what the funds have done”. Since 2014 the conservancy has not lost a single rhino, compared to the six it lost in 2013 and the seven in 2012. This turnaround of fortunes is attributed to increased vigilance by rangers and an electric fence erected round the conservancy using proceeds from the marathon. One of the ‘success rhino stories’ is that of Solio, the conservancy’s oldest rhino who died in December last year aged 42; surpassing the average wild black rhino lifespan of 30 to 35 years. Solio was known to many as the ‘grand old lady of Lewa’ after she was translocated from Laikipia’s Solio Ranch in 1984 to the Ngare Sergoi Rhino Sanctuary, which was later re-established as Lewa Wildlife Conservancy. She was part of the 14 that formed Lewa’s pioneering rhino population and gave birth to 10 calves during her lifetime, protecting and caring for all until they were grown and could care for themselves. Her family tree extends three generations consisting of more than 40 animals, which is a huge feat considering that Solio lived at a time when poaching decimated the once-thriving population of over 20,000 rhinos in Kenya to about 300 in less than 20 years. So successful has been the rhino conservation efforts at Lewa that the population has grown to 137, forcing the management to move 10 of them to the Sera Conservancy in Samburu and 20 others to the Borana Conservancy. The Marathon amplifies Safaricom’s spirit of transforming lives. For the past decade and a half, the marathon has had a huge impact on the lives of communities in Lewa and the conservation of the endangered species in the conservancy. We are happy with the progress and success of the marathon so far and we expect this year’s event to be even more successful. Bob Collymore, Safaricom CEO. This year’s edition will help the Trust and Safaricom to push their ambitious plan to raise over $1 million for the cause. The course record for the full marathon is 2hr:18 minutes, set by Philemon Baaru back in 2014. Two locals, Baaru and Fridah Lodepa, seem to have mastered the Lewa terrain as they have now won the race four times each.